Matches are made in heaven, and hence need nothing less than a paradise to be celebrated. Recreating the glory and charm of the 13th century Vijayanagar Palace and ornating it with striking elements of 18th century Goan-Portuguese artis The Leela, Goa. Offering the spectacular view of the Arabian Sea and a profusion of luxury and opulence served with hospitality, The Leela, for sure is one of the finest beach resorts in India. Also, having to itself the prestigious World Travel Award for being one of the best luxury beach resort in Asia-Pacific, makes Leela the ideal location for hosting your beach wedding in Goa. Sprawled over 75 acres of lush tropical gardens and bedecked with a virgin beach, Leela provides you with luxury unimaginable. Accommodation: The grand venue has a total of 206 luxurious options to stay in including 4 Royal Villas, 6 Club Pool Suites, 9 Club Suites, 5 Lagoon Deluxe Suites, 21 Lagoon Suites, 94 Lagoon Terrace Rooms, 66 Pavillion Rooms and 1 Presidential Suite. Food: Create your own menu for your events with the help of the culinary experts for your heavenly Wedding At The Leela, Goa. So if you’re planning to host a beach wedding in Goa at The Leela, with a guest count of about 200, here’s how much you might have to shed off your pocket. Tables & Chairs: Various reception venues provide different options for place sitting and linens. Dance Floor: Groove all you want along the swaying palm trees and salty winds by arranging for a spacious dance floor. Lighting & LEDs: Add the much-required bling to your soiree with proper LEDs and lights. Stage: Set up your stage depending on your venue. 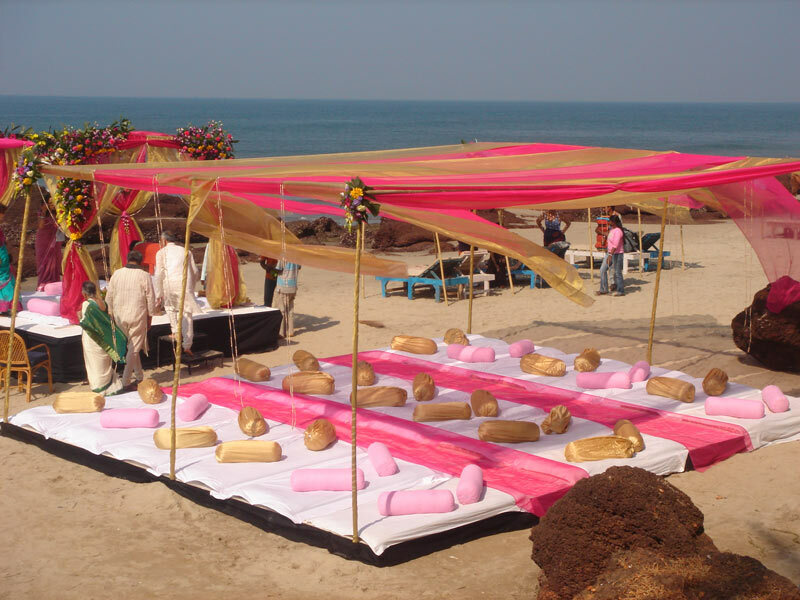 We advice you to pre-acquaint your wedding planner in Goa with your taste in décor and other amenities. Flower Décor: From mandaps to dolis, flowers are everywhere in a wedding! Make sure you order tons of them. Look out for the best photographers in the sunny state of Goa who possess the skill of capturing your best moments. Exclude yourself from the last minute jitters of wedding preparations by appointing a buzzing logistics crew. Pre-book your desired mehndi and makeup artists to turn all the heads! After all, it’s your day! 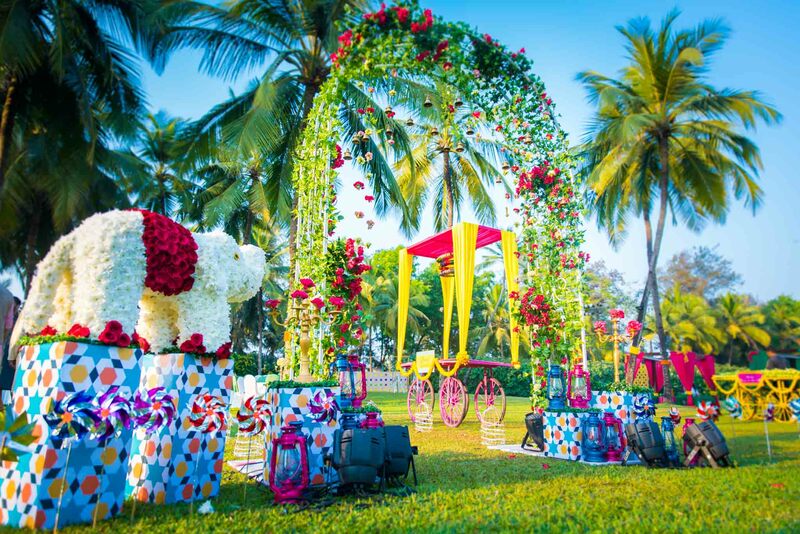 Displaying the rich culture of Goa through entertaining performances by the local group will surely keep the guests engaged and make your wedding eternal in their memory!